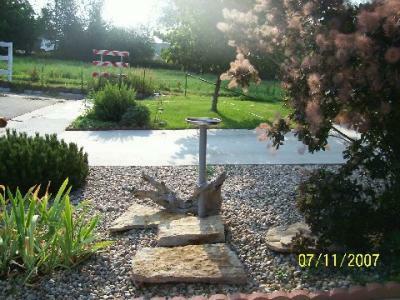 I am looking for the easiest way to build a outside bird bath. Take a planter pot, one that you would usually use for potted plants. Flip it upside down and then take the drip pan that you usually would slide under it and put that on top of it and fill with water. You could even salvage an old pedestal sink and put it in your garden, just plug up the drain with a stopper. Even a cool glass bowl on on a plant stand could work. Whether or not you'd like to use a pump or not that would be up to you. If you do choose to have a fountain instead here are some ideas! Try purchasing a unique ceramic, glass or terra cotta planter. It can be as big as you'd like it to be. It would also be fun to paint or create a mosaic of your own on one. You can purchase bright colored rocks, or marbles, maybe even a few aquatic plants. Place them in the planter and nestle in water pump that you can purchase at the hardware store for relatively cheap. Then pour a few rocks or whatever gravel like material you chose, if you have plants be sure that they are anchored down by the gravel but still are high enough so that the foliage sticks out above the water line. You can stack up tiles in the bottom of the container to elevate the height of the plants. Then the final thing to to is to make sure that your tubing for the pump (the end that pushes out the water) is secured as you'd like it, it can be hidden under something or sticking straight out of the top. just make sure it is above the water line, and then just plug your pump in. This project is cheap and relatively quick. Good luck. Here is what I did that worked very well. I took a piece of PVC pipe and hot glued it to a solid hubcap. (The bowl kind with out spokes in it) I also had a piece of drift wood that had a hole in it so I used it to brace the pipe. I glued two clay pots end to end and then put a plastic saucer (drip pan) on top. It lasted for years before coming unglued. Was easy to rinse and fill the "bird bath" part because it just lifted off. Height would depend on what size pots you use and how many.